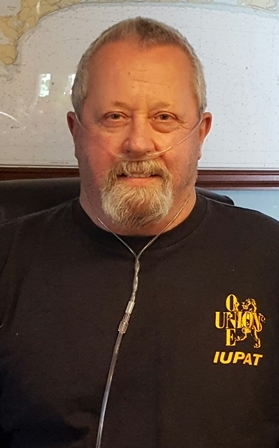 Bob (Okie) Okerfelt is 62 years young and is very ill. After years of struggling with severe COPD, a lung transplant is his only hope for survival. Transplants are lifesaving but financially draining. Okie grew up in Weymouth, attended Butera School of Art, Boston, married the love of his life, Kristen in 1981 and then moved to Duxbury. Shortly afterwards, he began his company Okerad Signs. He has been a member of The Painters & Allied Trades D.C. #35 since 1974. His illness prevents him from pursuing his career that he loves. Prior to his diagnosis, Okie was always the helpful person who would plow out his neighbors and stranger’s driveways during blizzards, volunteer to paint murals for the local fire department after 9/11 or help build playgrounds for his community. His illness prevents him from doing his favorite hobbies such as, fishing, riding his motorcycle and working around his house and yard. He has 2 wonderful children and 4 beautiful grandchildren. After many years of helping others, Okie is now the one who needs our help. Even with insurance, Okie is facing very high expenses for co-pays and deductibles, lab fees and post-transplant medications of up to $2000 a month or more for life. To help with the financial burden of Okie’s uninsured expenses, a fundraising campaign in his honor has been established with Help Hope Live, a trusted nonprofit organization that has been providing community-based fundraising guidance to patients and their families for more than 30 years. All donations are tax-deductible to the full extent allowed by law, are held by Help Hope Live in the Northeast Lung Transplant Fund, and are administered by Help Hope Live for transplant-related expenses only. Please consider making a contribution. Your support is critical to the overall success of Okie’s struggle. Please know that your contribution counts. On behalf of Okie and his family, we thank you in advance for your kind consideration. My brothers first biopsy results were great,,,,,no infection,,,no rejection!!! Yahoo!! Plus he got the green light to drive again! It was a very, very ,very thankful Christmas for all! My brother had his first bronchoscopy last Friday. Most lung transplant patients have this procedure 1 month after transplant. Bobby had to wait for 2 months based on his heart surgery along with transplant. This is a biopsy of the new lung to see if there is any infection or rejection. Doctor seemed happy with the procedure, now just waiting on results. Your continued support and prayers are greatly appreciated! Good appointment ,again! After transplant, my brother has to go each week to B&W for a clinical appointment. After today, he’ll start going every other week. His meds are slowly being reduced, he’s working on rebuilding his strength and his new lung keeps gaining capacity! Besides staying healthy and getting stronger, his goal is to get the ok to drive! Hopefully in the next few weeks he’ll get the yes to drive! Well, the doctors warned us that a transplant recovery was liking riding a roller coaster. Last Friday , my brother was readmitted to Brigham & Women’s due to acute edema in his legs, severe pain and a wacky blood reading. The team at B&W did a great job in setting realistic expectations in the beginning that he would be back in there at least 1-2 times during his recovery. So, he just got home today and is feeling much better! Thank you everyone for your kind words and prayers! My brother, Bobby, came home today! Jut imagine, only 11 days after his lung transplant and heart attack! Now the goal is for him to recover and stay healthy! The first few weeks will be very limited for him to have visitors, due to his susceptibility to get sick. Since his immunity has been suppressed, so his body won’t reject his lung, he has to be extremely careful over the next few months with his interactions with friends and family. You can always reach him on his cell phone! He loves talking with his friends! Thank you for all the continued best wishes and prayers! Great news!!! Okie got called in to Brigham & Women’s on Wednesday, Oct. 5th saying they had a donor for his lung transplant.He had a single lung transplant in the early morning of Oct. 6th. During the surgery his EKG started changing. On his way back to recovery, he had a heart attack and was wheeled right back into surgery where a stent was place in his artery. Thursday night he started communicating by nodding his head. Friday morning he began writing things down on a dry erase board. He was trying to speak, but he was still on the breathing tube. The tube was removed and he has been speaking since Saturday. Today, (10/9) Sunday he took his first walk. Short as it was, he still walked. He asked me how did the fundraiser go? Told him it was coming up. He’s disappointed that he won’t be able to attend. His recovery now is a little different from what we anticipated. Not so much different, just a little slower based on the heart surgery. If you cannot attend the fundraiser and would like to support Okie’s medical account, donations can be made directly to helpHOPElive. Thanks everyone for all your prayers and support! Wow! 10 days until our fundraiser, “An Evening of Fun” to support my brothers lung transplant medical account! Getting lots and lots of wonderful donations to raffle off at the event! Thank you to the community and friends who are driving this event! My brother, Bob, was listed with UNOS on June 30th. My phone rang at 4:14am on August 1st, he called to let me know he was called in for lungs! I felt like the expecting father who’s told by his wife, honey my water just broke! My husband and I paced and paced until Bob & Kris got to our house and we all headed into Brigham & Women’s Hospital. After 12 hours at the hospital, we were notified that this donor was not for my brother, We left the hospital thrilled, because we know this WILL happen for him! The hospital can call everyday and we’ll all be there! Thinking of you and Okie ! You are in our prayers . Hang in there Okie ! Best Wishes Okie and Kristen. In my prayers.